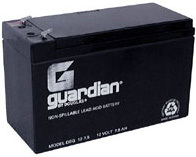 Maintenance-free, rechargeable sealed lead-acid battery. Can be used in any position and can be trickle charged for long periods of time. Excellent for alarms, communications and back-up applications. Best charged with a 1 amp trickle charger.